Air-tight foil packs of Hanguk Saffron have been shipped out to Kimcheelicious contributors and will arrive shortly after Christmas. I’ve spent so much time at the Post Office that I know each clerk by name. My business cards arrived and I have to say they look pretty slick. Next week I will be shipping vegan Napa cabbage kimchee (baechu), fermented radish (kkadugi) and Korean chili paste (gochuchang). 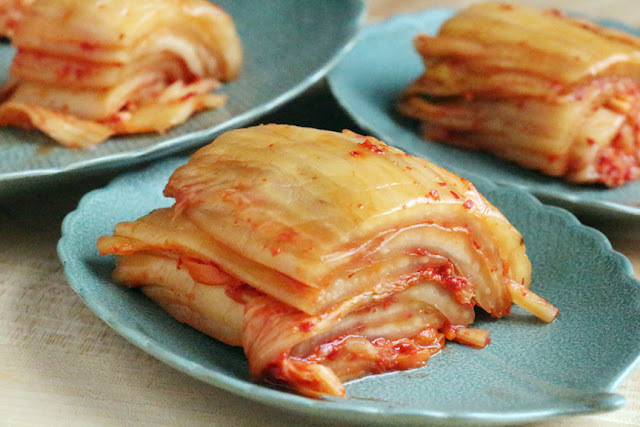 The style of kimchee that I made is called pogi, which is made by fermenting quartered heads that are attached at the base. This takes longer to make than mak kimchee (the variety typically sold in Asian grocery stores) but has a deeper, much more refined flavor. Mostly it slices up beautifully to make an impressive presentation for entertaining your guests. The kimchee has been vacuum-sealed in air-tight FoodSaver bags and will arrive via USPS Priority Mail. The bags are meant for shipping only. Contents should be transferred to an air-tight container and refrigerated for 24 hours before eating... although it tempting to just eat it right out of the bag. Tune in for more Kimcheelicious updates.